SynthePURE™ is a Whey Protein Isolate fashioned through a process performed at a much lower temperature than is typical for whey protein manufacture. During this process the protein powder is thoroughly filtered resulting in a high purity end product. The lower temperature has the effect of preserving the fragile biologically active peptides, lactoferrin, and immunoglobulins found in whey. 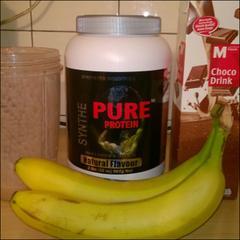 The result is a whey protein powder devoid of denaturation with no loss of biological activity. None of these factors are capable of bringing about muscle tissue accrual by themselves. Instead these factors complement each other and do so by facilitating the reduction of the breakdown or promotion of the synthesis of muscle protein. Some factors are only capable of positively effecting retainment or uptake of a single crucial amino acid while others have multifaceted roles to play. Most of these factors are not anabolic by themselves. Rather they contribute specific necessities to a central pool that together maximize anabolism. All of these factors modulate amino acids which come from protein.